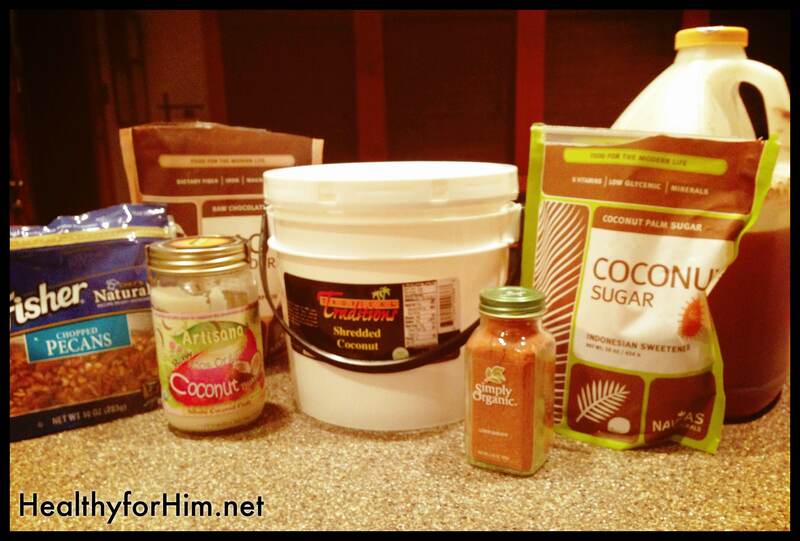 ← Paleo Cookbook and Websites I Love! This long silence from me isn’t normal, I realize this. I’m happy to report that I was traveling, with my family last week – Yes, ALL 10 of us went to back to my home-land (Iowa) for 6 days. “Well, what did you eat?” You ask? I also brought muffins I had been stock piling in the freezer, so each morning we’d go through a dozen morning-glory muffins at the breakfast table as well as some fruit! Lunch was sandwiches on our almond bread, with cut up fruit and carrot sticks… easy-peasy. Dinner was a bit more tricky, but the good Lord blessed us greatly with a sister of mine offering up her kitchen, and space in her refrigerator/freezer for us all week. While we had 2 min-fridges in our room, there was NO WAY we would fit all of our bread and muffins and keep them fresh for the week without an option like this! I packed a cutting board, a paring knife and a crock pot – and made simple meals that could cook while we played during the day. Did I mentioned what a blessing that was? HUGE. Not to mention inviting a family of 10 into your space for the week is no small feat. Grateful and blessed doesn’t begin to touch how we felt. When something as simple as eating can make or break a trip – it’s pretty big deal to us. THIS is what kept us well, all week-long. Not once did we get cross contaminated – which is nothing short of a miracle. So on the first night home, I did 6 loads of laundry, baked 2 loaves of pumpkin/pecan chocolate chip bread and whipped up a large batch of my new granola. The kids cheered with delight in the morning when they spotted the newly made batch of granola – so I just knew you’d like a chance to make it as well! 1 cup of organic apple sauce, unsweetened. Preheat over to 350 degrees. Mix all dry ingredients in bowl and set to side. Warm coconut butter on stove until melted, then turn off add in applesauce, and honey and stir into dry ingredients. Spread mixture out onto parchment paper on baking sheet. Bake 20 minutes while mixing through baking process (Every 5-7 minutes) so it does not burn. After cooling – simply put in a bag and scoop out with a measuring cup to serve onto yogurt or ice cream. Pray for me. My 20th reunion is next weekend and I’m going to run a 5K with my husband. If you remember, the last time I ran – last October… it was 27 degrees out and I was having a major flare. My knees locked up and I struggled to breathe, but I finished in a little over 30 minutes. A disappointing finish after my first 5K, but I finished. I know if I could run through that, I can certainly run now. Right? Right. Remember, every day is a day on the marathon towards health – each day trying to make progress. It’s not a sprint to be Healthy for Him – but it’s important to keep making the effort to move forward and away from those things that don’t build up our immune system! 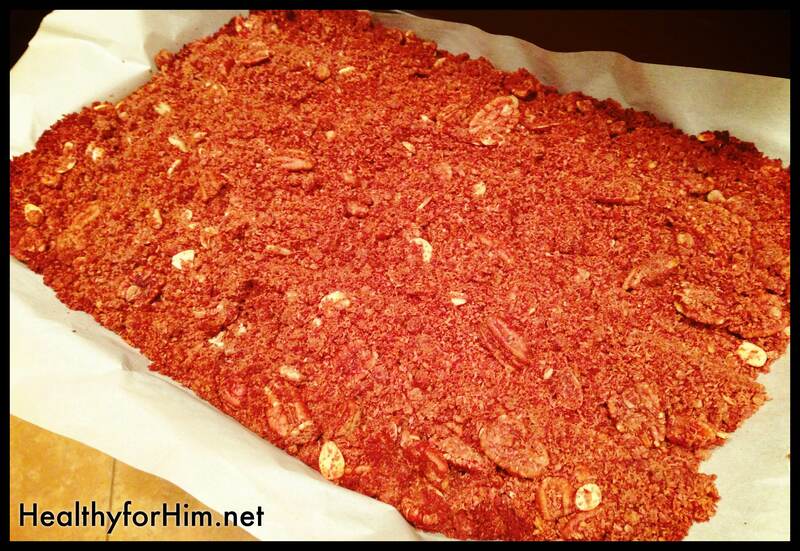 Posted on August 19, 2013, in Auto Immune Disease, Celiac/Gluten Sensitivity, Food To Try, Our Struggles and tagged AIP, celiac disease, gluten intolerance, gluten-free granola, grain-free granola, healthyforhim, MS, Paleo for large families, Paleo Granola. Bookmark the permalink. 4 Comments. Thanks for your comments Sonda! Hope you are well! We started school about 4 weeks ago, knowing we were taking a week off to go to Iowa. The kids enjoy starting early so we can get off earlier in the spring when the weather is mild!! Good to hear from you! Yay! I’m glad you found a safe place for encouragement! Sounds like you’re already doing a great job! Please feel free to share any tips with me as well!